Nevada from southern British Columbia through Washington and Oregon to central California. Oregon-grape grows at low to mid elevations in maritime to climates with fairly long growing seasons. Some sites may experience summer drought. Oregon grape is a common understory dominant throughout Washington State. This shade-tolerant species can grow in a closed canopy as well as an open meadow or clearcut. 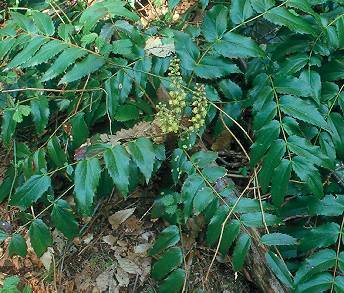 Oregon-grape occurs across a wide range of habitats in sub-montane to montane forests. Other common names include: None found. Collect the fruit in August to September and clean by macerating with water to get the flesh off. Seed requires cold stratification for 6 weeks. Dry seeds and store in sealed containers at temperatures just above freezing. Growth rate slow, vegetative spread rate moderate.